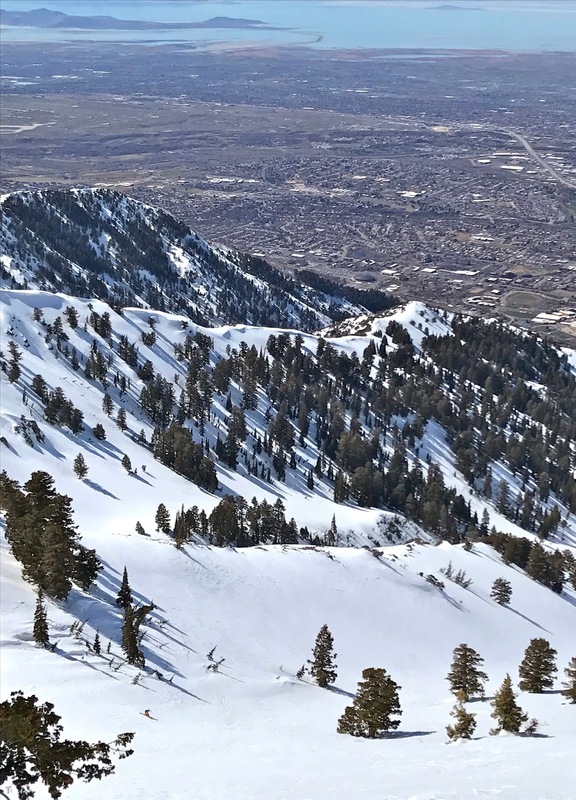 Mid-March in Utah is usually among the best time of year for good snow. Not this year. The sting of spring came early to the Wasatch. It also came with a lot of heat. So much heat that the phenomenal low elevation snowpack that we had vanished. ^In an attempt to find the silver linings in everything I could say that the good news is that it made it much easier to take my little guy out on cool walks on the east bench of Ogden City. ^Bad news is that it made our hikes out of our favorite backcountry zones on dirt all that much longer. 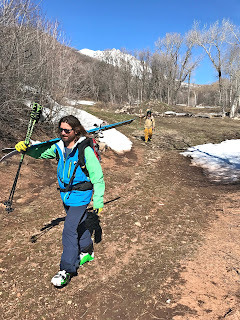 In this picture above my old touring partner Ben Geiger and our young buddy, Alex LeBlanc, are hiking out of a classic zone in bluebird skies and bright hot sunshine. ^We just play the aspects for corn snow though. That is the game when the sting of spring sets in and there is not powder snow to ski. Honestly though, it is a great time to explore new terrain. 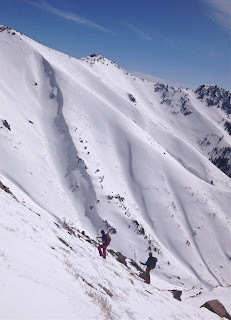 In the picture above Alex is getting into a famous Ogden gully for his first time. It makes me happy to show him around. There were people who showed me, and I have no problem returning the favor to the younger generations here. It is not mine to keep secret, and there is no real value in that mentality beyond the selfish. ^…because he is Ogden as F&%$! 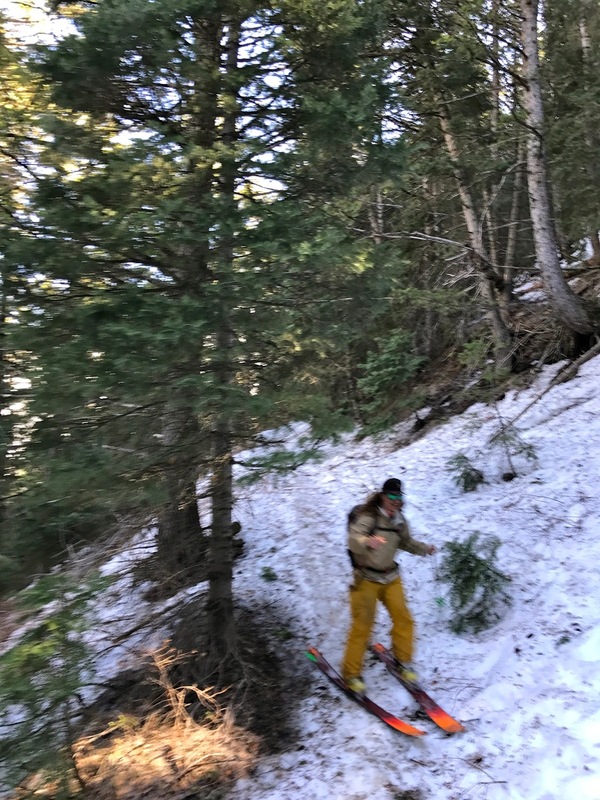 A little foul-mouthed saying I have taken on in regard to the Ogden backcountry experience at times. It can be brutal. The bushwhacking can be so relentless, but when there is no choice one has to just hunker down and accept the "shwhack"! Especially when the melt out is as full-on as it was going on. 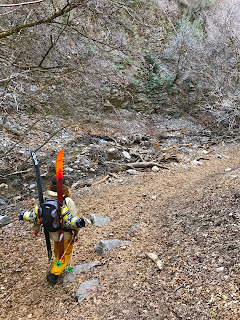 It tells me a lot about a person in how they handle themselves when I get them into a classic bushwhack or gnarly summer trail all frozen and iced up. Alex handled like a champ with no complaint. Seems he is indeed Ogden enough to handle it. I was glad the sting of spring touring in Ogden didn't get him down. Alex was actually stoked after the long ordeal to get out. There are not a lot of people in this world that would have been so after the kind of effort we put in that day. A lot of people look at that kind of effort in a negative light. On the walk out through summer trails littered with people we heard it multiple times. "Whoa, you coming from up there? Was it worth it?" That always baffles me because I can't even understand the question, "Worth what? The exhilarating exercise? The wonderful walk in the woods? The beautiful scenery? Worth what?". It seems that our brains don't even work in the same way. Maybe that is the difference between someone who does this kind of thing and someone who prefers a life seeking as little effort as possible. I don't really understand it, but it seems Alex is on the same page so at least I am not alone. Spring may have come early to the Wasatch, but I am certainly not done skiing, and it would seem Alex isn't either.